Since The beginning seem clear The use of music and sound effects with Movie was his Role functionally Great In expressing emotions. Through the ability to stir emotions and create different situations From the psychological feelings the spectator, This effect will confer on the scene and the event a higher meaning, The picture match the truth, And achieve what cannot express the characters, In emphasizing the character of the Movie and the composition of its structural unit, And there is no longer a Movie free of music or sound effects, Became effective for any visible image, Therefore, the researcher chose the subject of his research, (The Expressive Function of Music and Sound Effects in the Iraqi Cinematic Movie). Accordingly the research was divided into four chapters: It included the first chapter of the frame Methodical Search research problem centered in the following question: What is the Expressive Function of Music and Sound Effects in the Iraqi Cinematic Movie?, And the importance of research focused on highlighting one of the important elements, Which directs the viewer's feelings, Fit with cinematic picture, Determining the goal of research in detecting The Expressive Function of Music and Sound Effects in the Iraqi Cinematic Movie, This chapter also includes the boundaries of the research that were established in the year 2018 and the Movies that were presented at the 5th Babylon International Movie Festival. The terms were defined and defined in terms of terminology and procedure. .
1-Movie music is an effective and fundamental element in the Movie from beginning to end And contribute to linking the dramatic scenes and works to integrate the unity of content. 2-Music and sound effects can work on the mood of the spectator between joy or Sadness or anxiety, and the two cannot be excluded in deepening the sense of the dramatic even, As this chapter contains some of the conclusions reached in And then develop recommendations and proposals stemming from the research objective addition to the sources. 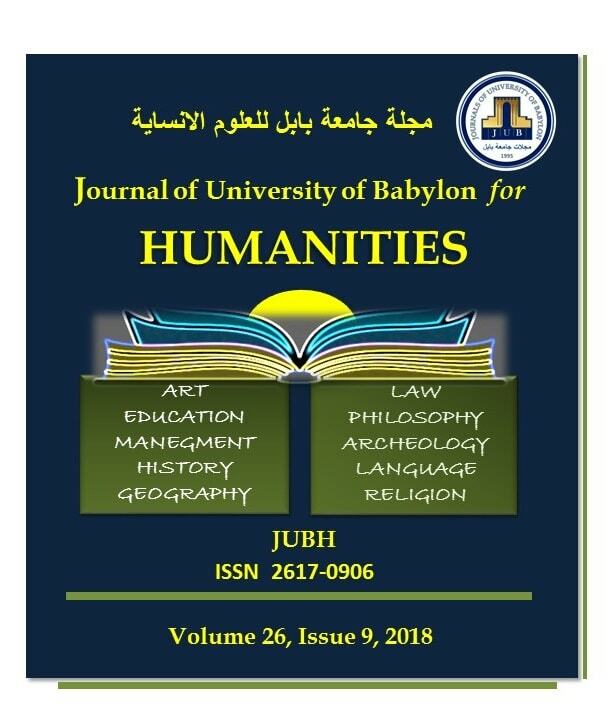 A. Miadedi, “The Expressive Function of Music and Sound Effects in the Iraqi Cinematic Movie”, JUBH, vol. 26, no. 9, pp. 507 - 537, Dec. 2018.